I first encountered this film because–can’t make this stuff up–someone on tumblr posted a fancasting of Femlock (Sherlock Holmes as a woman) with Rebecca Hall as Sherlock and Carey Mulligan as Jane Watson. The image of Hall was from The Awakening (2011), and I was not disappointed. The year is 1921. Florence Cathcart (Hall) is a skeptic “ghost hunter” and author who crashes spiritualist gatherings to expose the charlatans robbing grieving Londoners of their money. 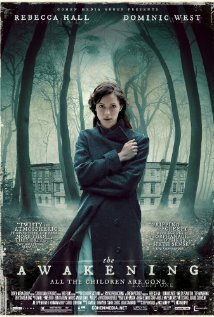 Robert Mallory (Dominic West), a teacher from a private boarding school, contacts her regarding a haunting at his school — not to find out who the ghostly little boy in the class photos is, but to investigate the recent death of a pupil who claimed to have seen the ghost shortly before his death.